Gently pass the tube a safe distance into the oesophagus. Raise vial. Ensure the head and neck remain above the stomach and ensure the tube stays in position. Hold the vial with middle finger in the handle above the tube clip and two fingers in the handle below. This way you can simply hold and guide the tube with thumb and index finger. With a pre-filled vial, this makes it easy for one person to use. 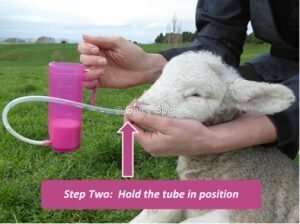 To ensure the tube stays in position during fluid flow – secure the tube with the same hand holding the animals head. 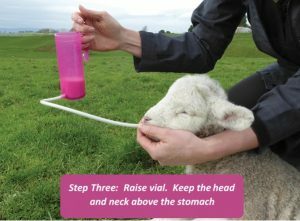 Ensure the head and neck of the lamb or kid stays above stomach level. 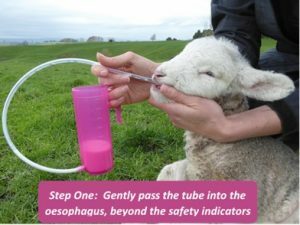 The tube safety marks indicate when you have passed the tube a safe distance past the airway entrance in a lamb or kid up to 6kg. When the printing cannot be seen outside the animal’s mouth you are far enough. Consider this distance a minimum as it is safer to pass the tube further than not far enough – yet it is unnecessary to pass the tube all the way to the stomach. You can check the tube position by looking in the groove on the left side of the animal’s neck. The oesophagus is a soft, collapsed tube enabling you to see the tube tip moving. Use the tube clip to keep the tube hygenic and above the fluid line when resting or filling the vial. In very cold temperatures you may like to warm the tube to soften. Always pass the tube gently. 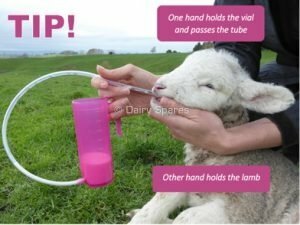 To stop flow during feeding simply lower the vial. Wait until all liquid has run through before gently removing the tube. We recommend washing your Trusti Tuber Lamb + Kid Goats after use with mild disinfectant and warm water. Do not soak in acid.